The big news this week has been the world premiere of the new Mercedes-Benz GLC. The second generation of the Tristar’s premium compact SUV (née GLK) trades its predecessor’s ultra-boxy styling for a sleeker, more rounded appearance, and will be available with right-hand drive for the first time – finally giving those who drive on the correct side of the road a credible alternative to the BMW X3 and Audi Q5. To showcase the new car, Mercedes has prepared a little video running through some of the main characteristics, from the handsome GLA-plus looks to the sumptuous C-Class-style interior; the latter is claimed to have “substantially more space” whether in front, at the rear, or in the boot. Also touched upon are the improved powertrains, better aerodynamic efficiency and the lighter construction. Available in standard, off-road and AMG Line variants, the GLC will be powered by either a 170 hp (GLC 220 d) or 204 hp (GLC 250 d) 2.1 litre turbodiesel, a 211 hp (GLC 250) or 241 hp (GLC 300) 2.0 litre turbo petrol or a 2.0 litre turbo petrol-electric hybrid (GLC 350 e) that will return a fuel consumption figure of just 2.6 litres per 100 km. Sales will commence in September, so we’re expecting a Malaysian launch sometime next year. 28 comments | Leave a comment? Mercedes-Benz GLC unveiled – the SUV sweet spot? Here it is – the all-new Mercedes-Benz GLC-Class. If the GLA was too small and the GLE (previously M-Class) was too big and expensive, this should hit the sweet spot for you. The GLC replaces the GLK in the Mercedes-Benz line-up. We never knew the GLK because it was only ever made in left-hand drive. But with global demand for SUVs on the rise, making the new GLC in both left- and right-hand drive was a smart choice. Built on the same Modular Rear Architecture that underpins the the new W205 C-Class, the GLC has its sights on the likes of the BMW X3 and Audi Q5. It’s 4,656 mm long, 1,890 mm wide and 1,639 mm tall, with a 2,870 mm wheelbase. The GLC’s wheelbase is a good 60 mm longer than the X3’s. Three exterior looks are available – other than the standard version, you can pick more off road-suitable bodywork with an improved 28 degree approach and departure angle, as well as head the complete opposite direction with a sporty AMG Line. Engine options should be close to a mirror of the C-Class – diesel-lovers will get a GLC 220d (2.1L, 170 hp, 400 Nm) or a GLC 250d (2.1L, 204 hp, 500 Nm). There’re also choices like the GLC 250 (2.0L, 211 hp, 350 Nm) and GLC 300 (2.0L, 241 hp, 370 Nm) for countries where petrol power is preferred. All variants get a nine-speed 9G-Tronic gearbox except for a GLC 350 e 4MATIC hybrid, which soldiers on with a hybrid-specific 7G-Tronic Plus. The GLC 350 e is quick – the electric motor provides plenty of extra power and it hits the 100 km/h mark in just 5.9 seconds while consuming just 2.6 litres per 100 km. If you’re hungry for more performance, you can pick the GLC 450 AMG Sport in the future. No word of an AMG GLC 63 for now – that might be reserved for the upcoming GLC Coupe. Both rear-wheel drive and 4MATIC will be available. Interestingly, left-hand drive and right-hand drive 4MATIC models will get different front to rear torque split. The left-hand drive’s differential provides a 45/55 front/rear split while the right-hand drive uses a smaller front differential for a more rear-biased 31/69 split. There are a few suspension choices – Comfort and Sport are based on steel springs. An off-road package raises the ride height by 20 mm. You can also upgrade to the optional Air Body Control (Airmatic) air suspension which is adjustable. Air suspension allows variable ride height. You can raise the GLC by up to 50 mm or lower it by 15 mm; the latter a feature useful to improve fuel consumption and stability on highway drives. The off-road pack also provides five selectable off-roading modes – Slippery, Off-road, Incline, Trailer and Rocking assist (in case the car gets stuck). A robust Gemtex underguard is provided and there’s an additional Downhill Speed Regulation feature. The GLC’s standard ride height is lower than its BMW rival though – it seems to have more of a crossover stance (but not as much as the GLA) compared to the X3’s outright SUV look. The GLC’s 1,639 mm height is about 36 mm lower than the X3. Since its 2,870 mm wheelbase is just 4 mm shorter than the E-Class, Mercedes-Benz claims rear legroom is almost as good as the E. The rear bench has a 40:20:40 split and has adjustable recline. The rest of the interior should be very familiar to you – it’s largely based on the W205 C-Class. If a W205 buyer upgrades to a GLC in a few years time, there might be a little less of that new car excitement because of the very similar interior. 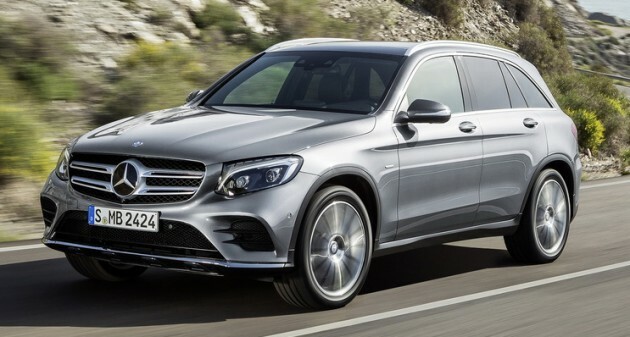 Worldwide sales of the GLC will start in November 2015, so a Malaysian launch is likely to be sometime in 2016. Dr. Dieter Zetsche, Vorstandsvorsitzender der Daimler AG und Leiter Mercedes-Benz Cars, Professor Dr. Thomas Weber, Mitglied des Vorstands der Daimler AG, verantwortlich für Konzernforschung und Entwicklung Mercedes-Benz Cars, und Ola Källenius, Mitglied des Vorstandes der Daimler AG, zuständig für Mercedes-Benz Cars Vertrieb, Gorden Wagener Chefdesigner Daimler AG, Claus-Dietrich Lahrs, CEO Hugo Boss AG und Petra Nemcova, Gesicht der GLC-Kampagne. Dr. Dieter Zetsche, Chairman of the Board of Management of Daimler AG and Head of Mercedes-Benz Cars, Professor Dr. Thomas Weber, Member of the Board of Daimler AG, responsible for Group Research and Mercedes-Benz Cars Development, and Ola Källenius, Member of the Board of Daimler AG, responsible for Mercedes-Benz Cars Marketing and Sales, Gorden Wagener Head of Design Daimler AG, Claus-Dietrich Lahrs, CEO Hugo Boss AG and Petra Nemcova, face of the GLC campaign. 17 comments | Leave a comment? The Mercedes-Benz GLC-Class will be unveiled tomorrow at around 11pm our time. If you’re in the market for a BMW X3 or Audi Q5 sized SUV, you’ll want to wait for this one. Check out the teaser video above for a preview of what will be unveiled tomorrow – we’ve also screen capped important bits and put them in a gallery below the story. This model was previously known as the GLK, but the GLK was never built in right hand drive. With market share shifting to SUVs and crossovers, the GLK’s replacement needs to be a global offering. The new name is in line with the brand’s new naming scheme – it’s an SUV offering based on the C-Class hence the GLC name, just like how the M-Class was renamed the GLE representing an E-Class SUV. 4 comments | Leave a comment? 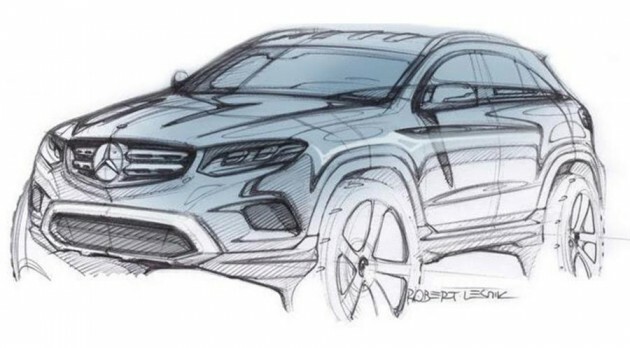 This is the first official sketch of the Mercedes-Benz GLC, which is set to make its debut on June 17. That’s two days from now, so let us give you a lowdown on what to expect from the GLK‘s successor. Unlike the GLK, the GLC (not specially made for high-earning Malaysian GLC execs, ‘C’ to link it with the C-Class) will be a global model with right-hand drive production; and as you can see from the very clear spyshots below, wears a less polarising suit. Mercedes has the GLA to cater to the entry premium SUV market now, so the GLC can be made bigger to better compete with the BMW X3 and Audi Q5. Compared to the odd-looking GLK, the new five-seater SUV should come with a longer wheelbase, wider track and a more forward front axle; all when combined, should improve cabin space and dynamics. Expect a cabin that’s not too dissimilar to the W205 C-Class’ and a range of engines, from a 2.0 litre four-cylinder and 3.0 litre six-cylinder petrol in the GLC 250 and GLC 400 to a 2.1 litre four-cylinder diesel in the GLC 220d and GLC 250d. Rear and four-wheel drive will be available. A plug-in petrol-electric hybrid GLC 350e (same powertrain as the C 350e that we recently tested) is also on the cards, and AMG-developed models (3.0 V6 turbo GLC 450 Sport and full-fat 4.0 V8 turbo GLC 63/GLC 63 S) will top the GLC range. It’s only natural for Mercedes to offer a star-badged alternative to whatever Munich has, so in the near future, expect a BMW X4-rivalling ‘coupe’ version of the GLC with a sloping roofline. Previewed by Auto Shanghai 2015’s GLC Coupe concept, it has been confirmed for production. 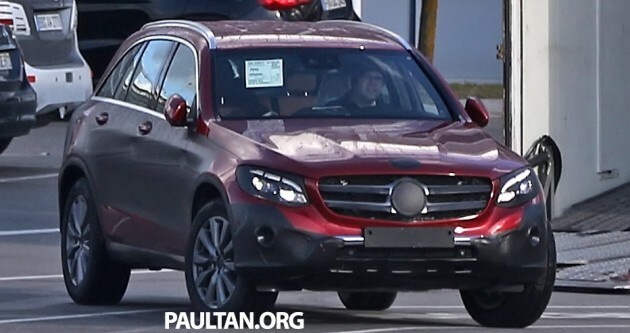 The Mercedes-Benz GLC-Class has been spotted again, with very little disguise on. Let’s remind ourselves of the Tristar’s new naming rules – the GLK is to be renamed GLC, because it’s C-Class-based. It’s gotten a bit bigger to avoid suffocating the smaller GLA – visible (just) are a longer wheelbase, wider track and a more forward front axle, which should improve cabin space and dynamics. 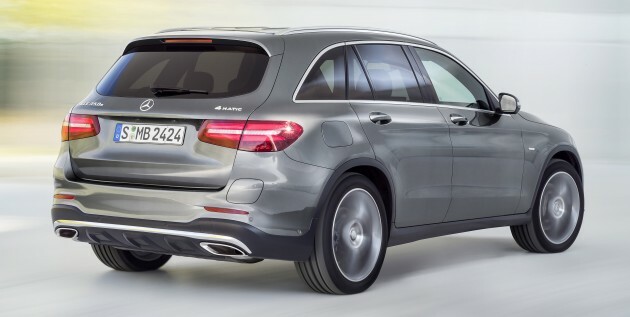 Unlike its boxy predecessor, the new GLC wears a more curvaceous dress, with a more sloping back end. Also, unlike the GLK, there will be right-hand drive GLCs, reports say. More potential markets, then – will Malaysia be among them? If so, the Audi Q5 and BMW X3 will soon no longer be on their own in these markets. Speculated is a base GLC 250 with a new 1.8 litre four-cylinder turbo engine, a GLC 250 BlueTEC with the familiar 2.1 litre four-cylinder turbodiesel and a V6-powered GLC 350. We’ve seen something before that could be a GLC 350 e plug-in hybrid, and our carparazzi expects AMG versions in the future, too. There’ll also be a ‘coupe’ derivative, previewed by Auto Shanghai 2015’s GLC Coupe concept. This will take the fight to the BMW X4 when it surfaces in 2016 or 2017, after the non-coupe GLC makes its debut. 7 comments | Leave a comment? Last month we showed you a rendering and some spyshots of the upcoming Mercedes-Benz GLC-Class. Let’s remind ourselves of the Tristar’s new naming rules – the GLK is to be renamed GLC, because it’s C-Class-based. Look at the interior and see if you can spot some differences. Unlike its boxy predecessor, the new GLC wears a more curvaceous dress under a slightly larger body, giving the smaller GLA more room to breathe. Also, unlike the GLK, there will be right-hand drive GLCs, reports say. 9 comments | Leave a comment? With the upcoming Mercedes-Benz GLC-Class, it will be the first time the German brand will have a competitor to the BMW X3 that it can field in all markets, as it’s set to be available in right-hand drive as well. Its predecessor, the GLK, was offered only in left-hand drive so the lion’s share of the premium compact SUV segment in our market has been pretty much left to the X3 and the Audi Q5. 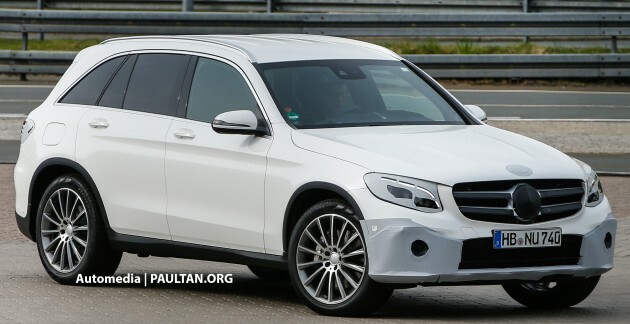 The new GLC will be built on the platform of the W205 C-Class, so it should share the same engines as well. This means there will probably be a GLC 350 e plug-in hybrid model available – it’s likely the model we’re seeing here cold weather testing as we can see the socket flap on the right of the rear bumper. 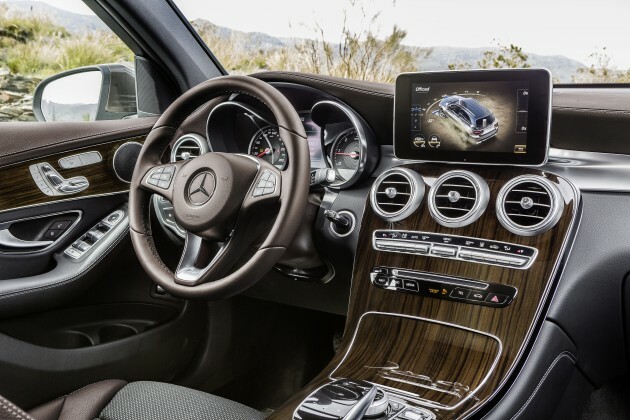 We also had a peek into the interior of the GLC back in 2013 – the interior looks heavily based on the C-Class. 1 comment | Leave a comment?